International demand for Mexico’s Hass avocados is keeping the country’s industry thriving, with exports this year forecast to rise 18 percent to more than 1.0 million tonnes, valued at over $2.8 billion. 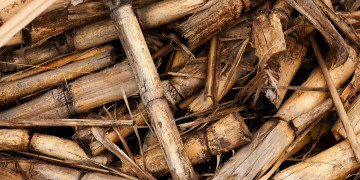 That comes as production will largely remain flat, at about 2.0 million tonnes, and expectations are for a comparable size crop in 2018/19, according to recent USDA forecasts. Although Mexico’s planted area for avocados will expand 5.7 percent, to 231,028 hectares for 2018, that increase represents a slowing pace from previous years as producers turn their efforts toward increasing yields rather than expanding into new areas. 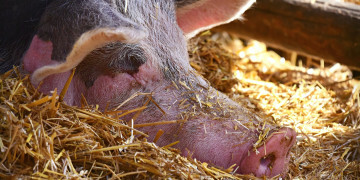 The USDA reports that production has been aided by favorable weather conditions as well as the implementation of phytosanitary pest-control programs, which are measures taken to decrease the chance of pests in the crop and to lessen the chance of pests spreading to other areas. The Mexican Avocado Association of Producers and Export Packers (APEAM) is working with growers in Michoacán state, where over 80 percent of production occurs, to invest in new technology that will further boost avocado production. Strong US demand, which receives about three-quarters of all Mexican avocado exports, has given a huge boost to the industry. 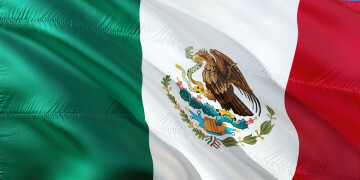 Mexico benefits from year-round access to the US market, where consumers eat an estimated 4.25 billion avocados annually, according to the Hass Avocado Board. Exports to Canada, Europe, and Japan are also increasing. High prices in the 2017/18 marketing year have prompted growers to favor the export market, limiting supplies available for domestic consumption. 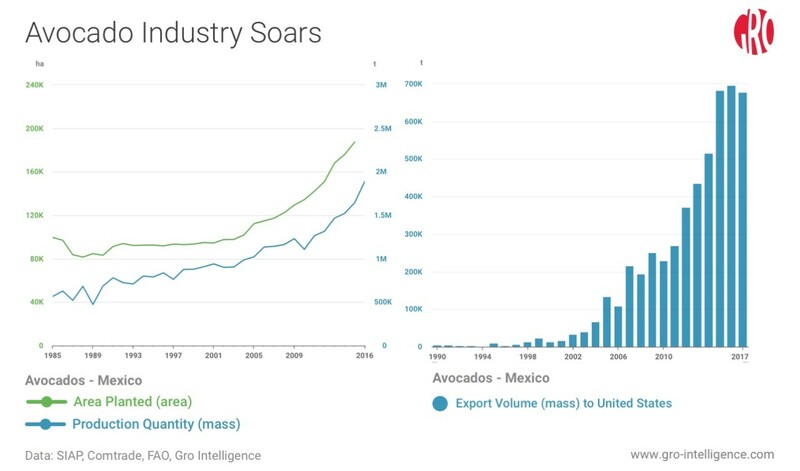 Gro Intelligence subscribers analyze developments on Mexico’s avocado industry by accessing the latest data, including production, exports, and planted area. Mexico’s avocado industry is growing to meet increased demand, mainly from the US, where a majority of exports head (bar chart at right). Both production quantity (left chart, green line) and planted area (left chart, blue line) have increased rapidly.